The High-Luminosity LHC will make it possible to study the fundamental building blocks of matter in more detail than ever before. Cern, the organisation that operates the LHC, held a ground-breaking ceremony on Friday to mark the beginning of civil engineering works. The vast LHC is housed beneath the French-Swiss border, near Geneva. The upgrade will boost the accelerator's potential for new discoveries in physics, starting in 2026. "The HiLumi project will allow us to get a lot more out of the LHC than we have been able to get so far," said theoretical physicist Prof John Ellis. "It's going to enable us to probe much deeper into the history of the Universe, look at very rare processes and study particle physics in much more detail than the regular LHC." The LHC uses thousands of magnets to steer two beams of proton particles around a 27km-long circular tunnel located 100m underground. The beams circulate in opposite directions at close to the speed of light. At allotted points around the tunnel, the beams cross over allowing the proton particles to collide. The idea was that smashing these proton beams together would yield evidence of previously unseen phenomena in physics, including new sub-atomic particles. In 2012, physicists confirmed that the LHC had uncovered the sought-after Higgs boson particle, the last missing piece of the framework known as the Standard Model (SM), our best theory to explain how the Universe works. While the LHC has helped scientists study Standard Model physics in greater detail than had been possible previously, they had hoped to see evidence of phenomena not explained by the SM. Many had expected the LHC to uncover signs of supersymmetry, a theory predicting the existence of "partner" particles that accompany those we already know about in the SM. But hints of the predicted "new physics" have failed to materialise. 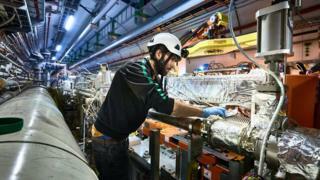 The upgrade will aim to make the LHC produce even more collisions, increasing the chances of discovering new particles. It will do this by boosting the beam luminosity - a measure of its intensity, and an indicator of the number of potential collisions that can be produced. "We will increase by a factor of 10 the number of collisions produced by the LHC - which is a lot," said Lucio Rossi, project leader for the HiLumi project. Paolo Ferracin, the inner triplet magnets engineer for HiLumi, commented: "What we are trying to do is focus more the cloud of particles. Basically, if this cloud is smaller, more compressed, we increase the probability of collisions between the two clouds." The construction work required for the upgrade will include building an 80m-deep shaft, an underground hall to house cryogenics equipment and a 300m-long tunnel to house power converters. Although evidence of new physics has been hard to find with the LHC so far, scientists recently unveiled promising results for a hypothesised new particle, called the sterile neutrino, from the MiniBooNE experiment at Fermilab in the US. In addition, there are hopes that signs of the elusive dark matter could be turned up by Xenon 1T, the most sensitive experiment of its kind, which has now been gathering data for a year.